President Trump ruffled German feathers this summer, saying the North Atlantic Treaty Organization (NATO) ally was “totally controlled” by Russia. Chancellor Angela Merkel was less than pleased. What did Trump mean, and what does it portend for European geopolitics? Trump’s complaint centers on the Nord Stream 2 (NS2) pipeline, which, when completed, will carry Russian natural gas hundreds of miles across the Baltic Sea to Germany. The project, which is led by the Russian state energy giant Gazprom, was approved by the German government in March, part of its commitment to wean the country off nuclear and coal power. Trump’s strong rhetoric aside, Germany is highly dependent on Russian gas: it currently gets about 40 percent of its supply from Russia. That makes Germany the EU’s largest consumer of natural gas. 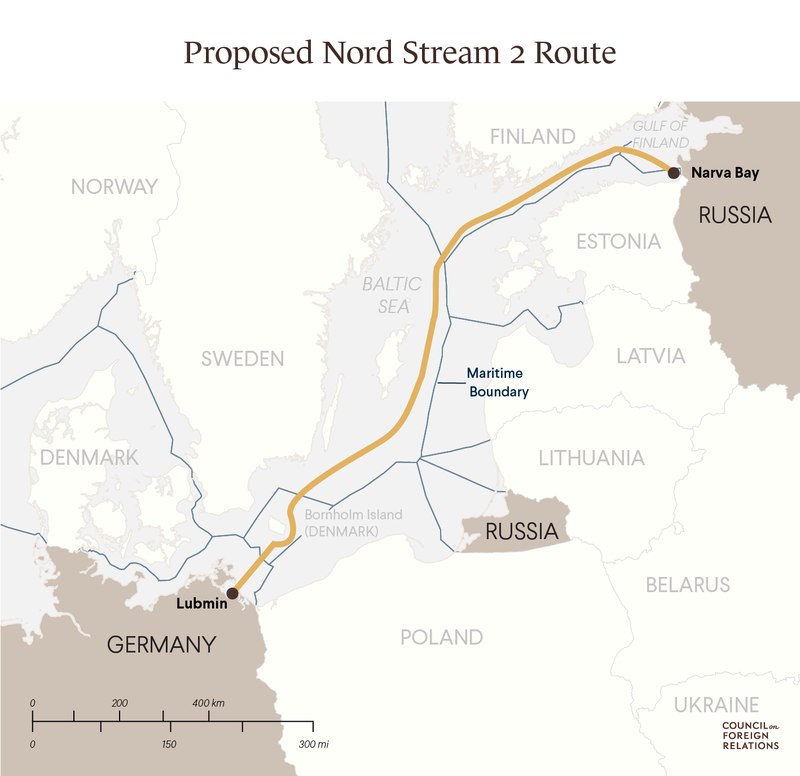 The NS2, which follows the same route as the Nord Stream 1, a pipeline completed in 2011, could potentially double the flow of Russian gas into Germany. The European Union (EU), as a whole, relies on natural gas for nearly a quarter of its energy, and Russia currently provides more than a third of that. However, some EU countries are much more dependent on Russian gas than others, with many countries in Eastern Europe getting two-thirds or more of their gas supplies that way. Meanwhile, some Western European countries, such as Spain and Portugal, don’t get any gas from Russia. Washington warns that the NS2 will undermine Western sanctions against Russia, which were put in place after its 2014 annexation of Crimea, and give Moscow more geopolitical leverage. Russia has previously cut off gas to Ukraine and Eastern Europe—during the freezing midwinter—in the course of disputes. Trump’s criticisms are more blunt than his predecessor’s, but they are not new—the Obama administration, too, opposed the pipeline. 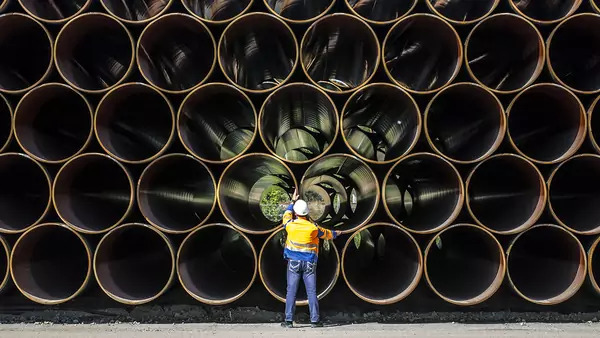 Ukraine, the Baltic states, and Eastern European countries such as Poland are also opposed, fearing that the project could allow Russia to bypass existing pipelines through their territory, crippling their energy supply and depriving them of lucrative transit fees. Germany makes several rebuttals. First, that the NS2 is simply the most cost-effective option for meeting the continent’s growing energy needs: the pipeline will be much cheaper than overland deliveries from Eastern Europe. Second, that U.S. opposition is driven mostly by Washington’s desire to sell more American liquefied natural gas (LNG) to European markets. Others note that the first Nord Stream project has not stopped Germany from taking a hard line against Russia’s expansionism. The pipeline was originally set to be completed by the end of 2019. That now looks to be delayed, as Denmark, one of the five nations whose waters the pipeline crosses, is still weighing its approval over environmental and security concerns. Even if Denmark ultimately withholds its support, the line could likely be rerouted to avoid its territory. The U.S. response remains to be seen. Trump has already shown his willingness to levy tariffs on U.S. allies in the EU, and his administration has threatened sanctions against European businesses if the NS2 goes through. Trump also floated reopening talks on a U.S.-EU trade deal if Germany dropped the pipeline. Meanwhile, Trump has pledged his support to the Three Seas Initiative, a grouping of Central and Eastern European countries, led by Poland, that seek energy independence from Russia. The first shipment of U.S. LNG arrived in Poland last year, and new terminals are being planned across the Mediterranean. Merkel’s August 2018 meeting with Russian President Vladimir Putin could augur greater cooperation on energy issues. The Financial Times explains why Germany has become one of Trump’s favorite targets. Bloomberg investigates Germany’s “addiction” to Russian natural gas. The NS2 proposal is dividing the West, argues the Washington Post.